Took a picture while hubby was doing his FTP test. 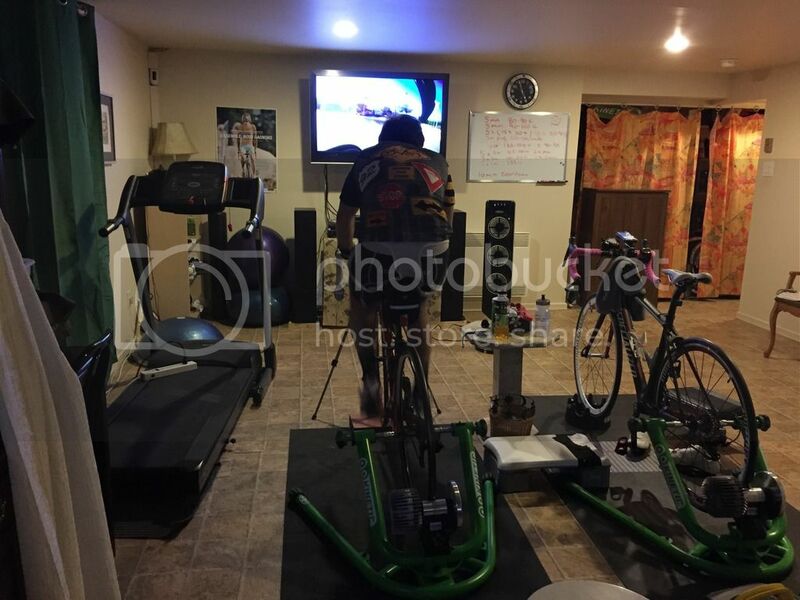 Part of this room is not showing (wall with our Sufferfest flag and other wall with all my bands, mats, his bike roller, etc. IT looks similar to my loft, except that we do have regular furniture (desk, shelves, and drawers) in there, too. When we put the trainers away, it feels so much larger. My home gym has changed a lot since I started this thread. I can't ride any more so no indoor riding Oh well, I never really did like that anyway. I've all the competition weights from 6kg (black one on the right), to the 18kg (purple on the left). It isn't normally organized this way of course, just trying to get everything in the shot. Getting the big stretch band visible was challenging. There is also a white-board, but I couldn't get everything in the shot as I wanted to show my Jungle Gym suspension system. Everything gets used, and I doubt there will be a need to expand my herd. The nice thing is that if I have to drop my group KB training, which I may need to do so, then I can do everything I need to do at home. I've close to 100 workouts set aside and a decent understanding of what I need to avoid - which is just as important as knowing what to do! 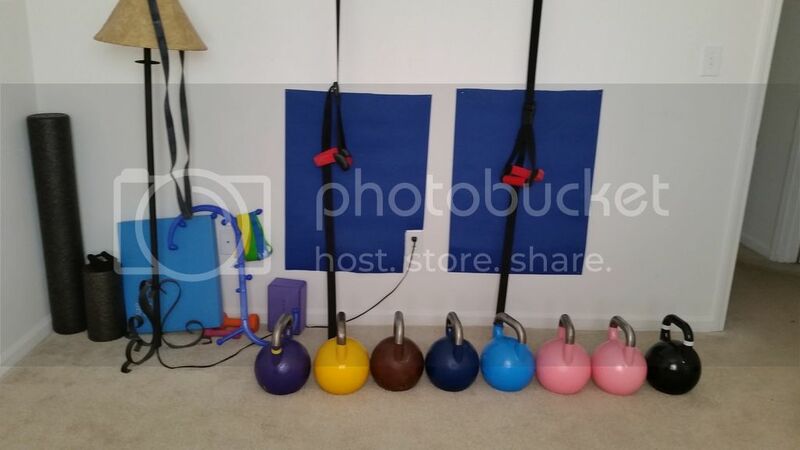 I CAN use kettlebells for cardio - and DO - but it is best to mix it up. I like the sound system Helene, though I have to admit that I usually train in silence when at home. Then again, I don't think I COULD work on an indoor bike trainer without movies, music, SOMETHING. Last edited by Catrin; 03-22-2015 at 12:43 PM. Interesting thread.... of course something that I love Keep up the great work everyone!! OOPS! Almost forgot the two trainers HA! Love your gym rooms too. If it was only up to me, I'd have the whole basement just for this. But we have to be reasonable, they say! So I keep the other half for our wood working tools. Yesterday I went to my LBS and talked about trading-in my bike for the 2015 model. I knew it would be too expensive but hubby wanted to know. So to get the same same bike, only different colour and model 2015 instead of 2014 (and I get to keep my wheels (I just love them), seat (I'm comfy on it and afraid to trade and hating it) and the crank because mine is easier, I'd have to cough out $1200 plus taxes. So no way. I'm gonna keep my "ugly" coloured bike that rides soooo well and purchase a nice Bellicon trampoline in the fall instead. Last edited by Helene2013; 03-23-2015 at 04:23 AM. Good move Helene, while I really like the color of my bike, I can't say the color of mine nor anyone else's has ever crossed my mine once I'm riding. Furniture sliders??? What are they? Guessing has nothing to do with moving the couch? That is exactly what they are Slippery disks that are placed beneath the legs of heavy furniture to help slide it around. also quite useful for a wide range of floor body weight exercises like mountain climbers. Home Gyms are a great idea. I am a personal trainer for www.everybodyspersonaltrainer.com which is an in home personal training company and I love it.